I just came back from a week in Palestine and will attempt to make a small report about this new visit in five parts these coming days. The most urgent one is most certainly the one dedicated the current situation in Jerusalem’s Old City, where the Israeli police currently exercise an additional layer of Apartheid violence on Palestinian devotes, visitors, residents, and protesters. In the morning of July 14, three Palestinians killed two Israeli police officers controlling access to Al Haram (the Mosques Esplanade) in the Old City, in East Jerusalem before being killed themselves. 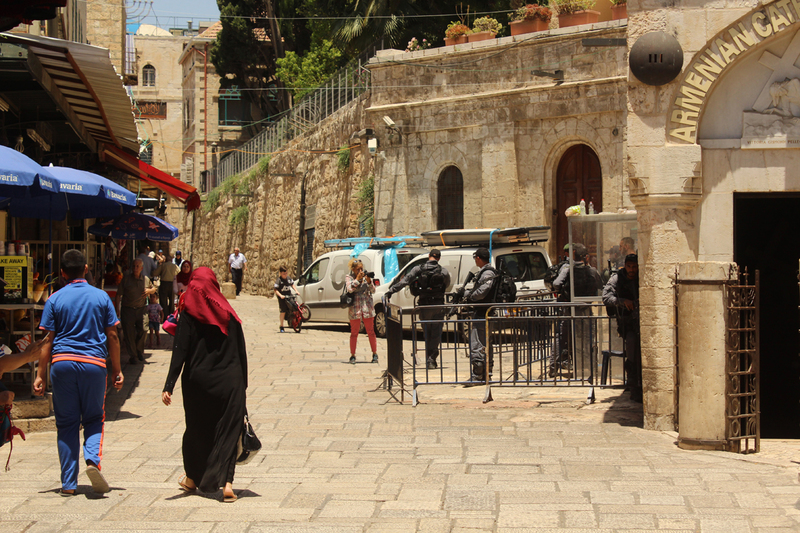 In reaction, the Israeli police shut down the old city, authorizing only residents and Israeli settlers to enter the Holy city at first, then a couple days later, pilgrims and other non-Palestinian visitors — the photographs presented below were taken on July 17. Since then, the Israeli police have reopen the access to the Old City, as well as to Al Haram, but conditioned it on Friday to the sole entrance of Palestinians aged above 50 years, as well as to an obligatory passage through metal detectors, adding a layer of control to a territory already saturated by Apartheid apparatuses. Large prayers right outside the Old City were organized, as well as protests whose violent suppression lead to the death of six young Palestinian men these last two days. On Friday, a video could be seen of Palestinian protesters attempting with difficulties to evacuate the dead body of Mohammed Abu Ranam to prevent the Israeli police that had just killed him to capture it in order to significantly delay its funerals as they usually do. Before getting to the report part of this article, it seems useful to re-introduce the territorial and legal role of Jerusalem in the Apartheid in Palestine. Cut into two during the ethnic cleansing that created the State of Israel in 1948, the eastern part of the city was under Jordanian administration before the Israeli invasion of 1967 (see recent article about the Six-Day War) and the official annexation to Israel in 1980 that was almost unanimously condemned by the United Nations Security Council Resolution 478 (only the United States abstained). Today, the presence in East Jerusalem of eleven Israeli settlements hosting over 200,000 settlers, of several police, municipal, and governmental buildings (including some ministries), of various layers of infrastructures (including the recently built tram line), as well as of the Apartheid wall that separates the city from the West Bank, render the 1949 Green Line difficult to perceive spatially. This is particular true when it comes to the Old City whose West wall is adjacent to the Green Line: many Christian pilgrims and other punctual visitors often enter it through the Jaffa Gate directly connected to the West part of the city, while Palestinian access is understood to happen solely through the Damascus, Herod’s, and Lions Gates in the North and East — as for Jewish pilgrims, they mostly enter the Old City through the Dung Gate that gives a direct access to the Western Wall since the destruction of the entire Maghrebi neighborhood the same day of the invasion of 1967. 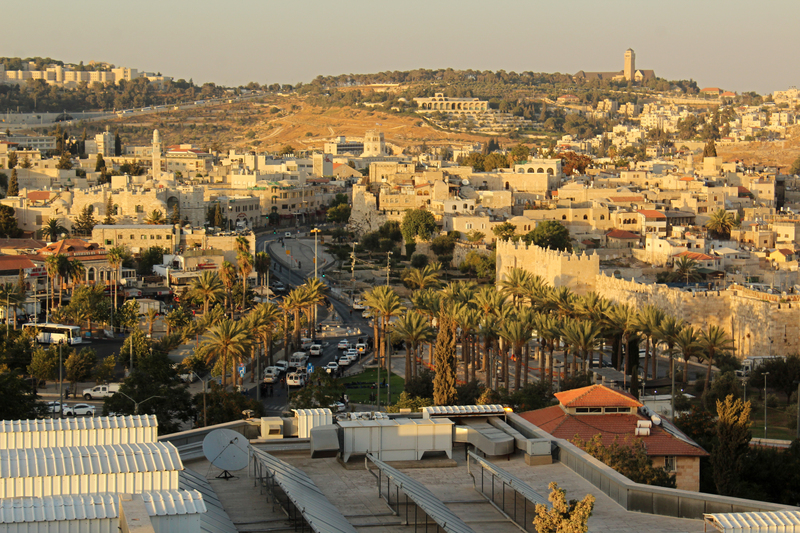 As the Israeli government and municipality understand the Palestinian part of the city, including the Old City, as being annexed, it is the heavily armed police that operates in the city, and not the occupation army as it is the case in the West Bank, thus contributing to a higher degree of normalization of the Apartheid. 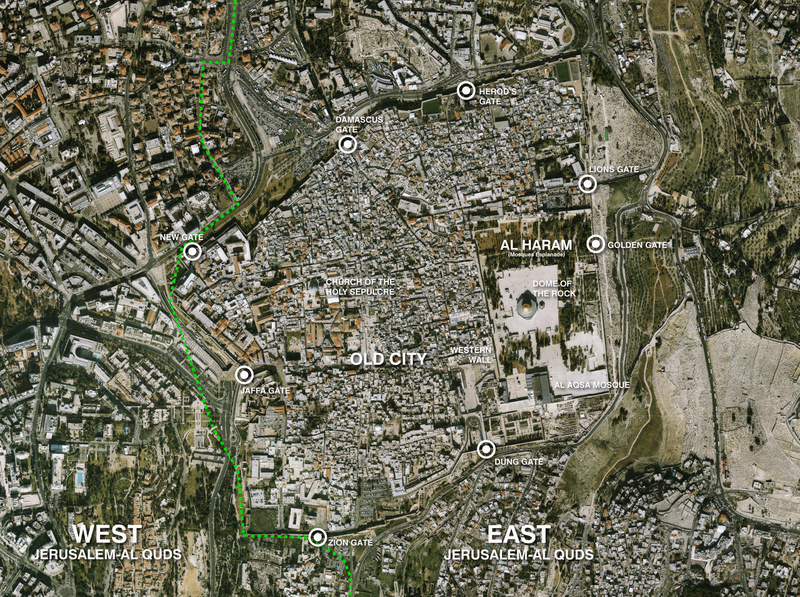 Map of Jerusalem-Al Quds (The Funambulist, 2015). The red line illustrates the location of the Apartheid Wall. Click for a higher resolution version. Map of the Old City (The Funambulist 2017). Conceived as a report, the following lines are limited to my own subjective experience of the closure of the Old City. As such, they can only present a diluted version of the reality, because of the recognizable outsider nature of the body of their author, as well as of the difficulty to produce photographs of the situations witnessed, these documents being able to function as evidence (see past article). 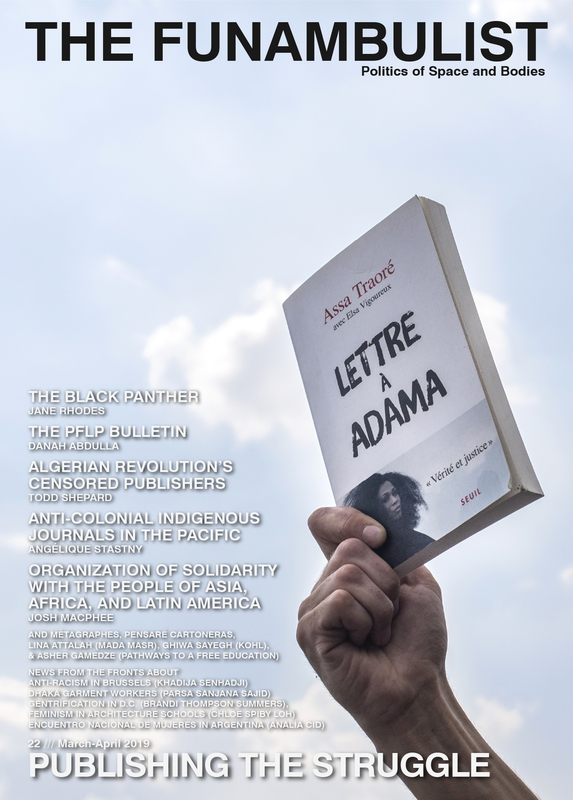 Nonetheless, when it comes to the Apartheid in Palestine, the non-spectacularness of violence that contrasts with the telegenic images of rebellions and their brutal repressions, attests of the daily, systematic, and ubiquitous characteristics of this violence. The photographs below illustrate the additional measures of control set up by the Israeli police. They involve the transformation of Sultan Suleiman street, adjacent to the northern wall of the Old City, into a militarized zone implementing several layers of checking, searching, and filtering people wanting to access the Old City — which also have significant consequences for the commerce that rely on this street, in particular Palestinian buses serving eastern and southern towns and villages of the West Bank. 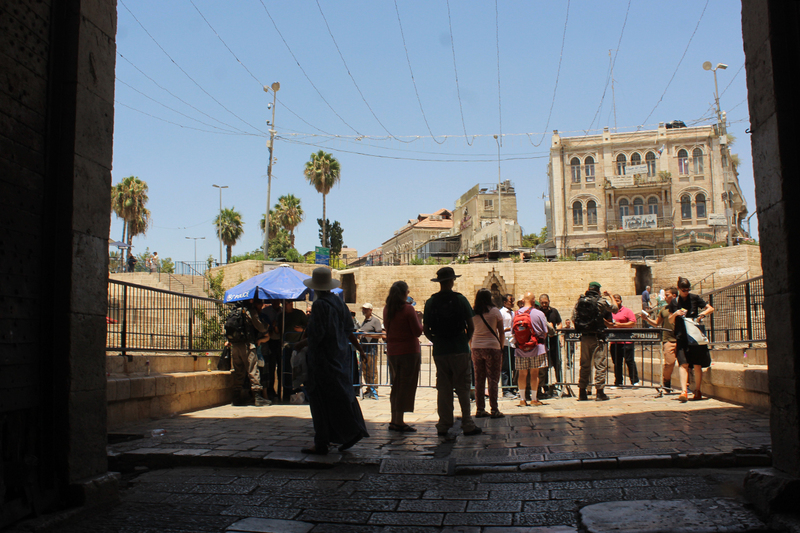 Three days after the closure, foreign visitors were allowed in the Old City while Palestinians were systematically questioned and denied access if they could not prove that they reside inside. The feeling I had was later confirmed in this brilliant opinion piece by Palestinian lawyer Diana Buttu: Jerusalem is becoming Hebron. As written in a past article, the southern large city of the West Bank concentrates in its urbanity all elements of the Apartheid: Israeli settlements in the Old City, military checkpoints to access the holy grave of Abraham, immune population of settlers perpetuating violence against Palestinian residents, brutal and sometimes deadly arrests and suppression of protests by the Israeli army, forceful closures of commerce in the name of “security,” segregation of the infrastructure, etc. Jerusalem’s Old City already counts many Palestinian houses that have been evicted before being occupied by Israel settlers — the most famous one being the one occupied by no other than Ariel Sharon in the Muslim Quarters — and, although the administration of Al Haram is exercised by the Islamic Waqf, its access is controlled by heavily armed Israeli police officers. 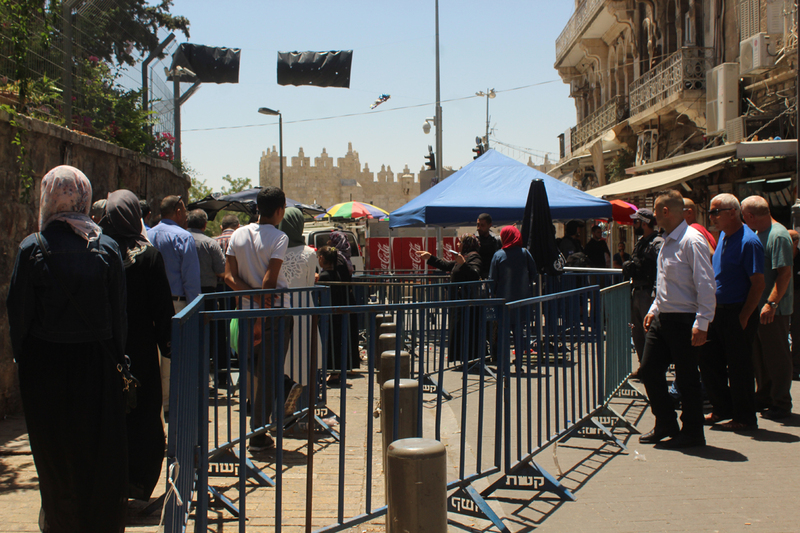 The implementation of no less than three layers of checkpoints at the entrance of the Old City and metal detectors, as well as searching booths inside the city itself (see below) finalize to make the comparison with Hebron a relevant one. – A Palestinian young man being asked where he comes from by an Israeli police officer at one of the Old City checkpoints. “Bethlehem” he answers. “Where is that?” asks the officer. Signs of disbelief on the young man’s face, split between anger and amusement. – Indifference of the same police officers to the burgundy and blue colors of my passport and those of my colleagues, who let us access to the third layer of checkpoints. – An American tourist wearing shorts and sneakers right outside the Mosques Esplanades, joking and laughing with an Israeli police officer holding a machine gun. – “People are so nice. What’s not to like? !” asks another American tourist a few meters further. – “Guarda! Questa casa e la casa di Ariel Sharon” screams an Italian guide to a group of tourists taking photos of the bridging house in the Muslim Quarter displaying a large Israeli flag on its facade. Sultan Suleiman street between the Old City and northern East Jerusalem shut down by a massive amount of Israeli police officers in the evening of July 14. 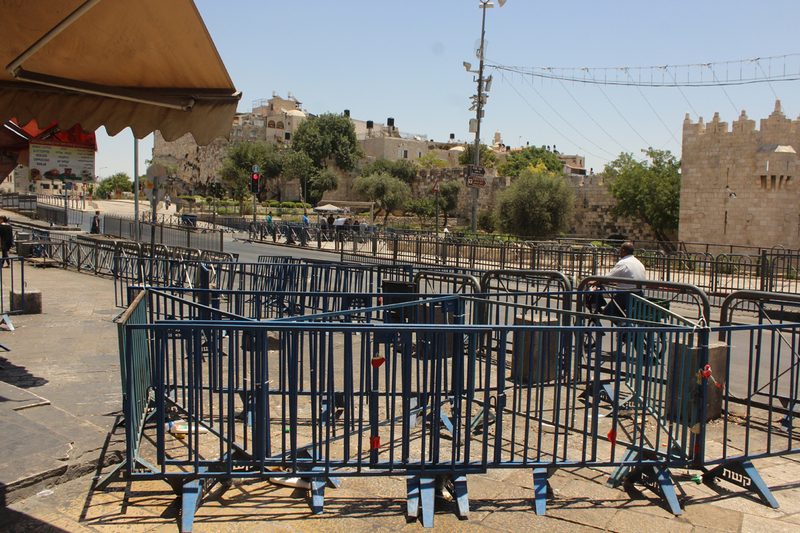 First layer of checkpoint to access Damascus Gate on July 17. 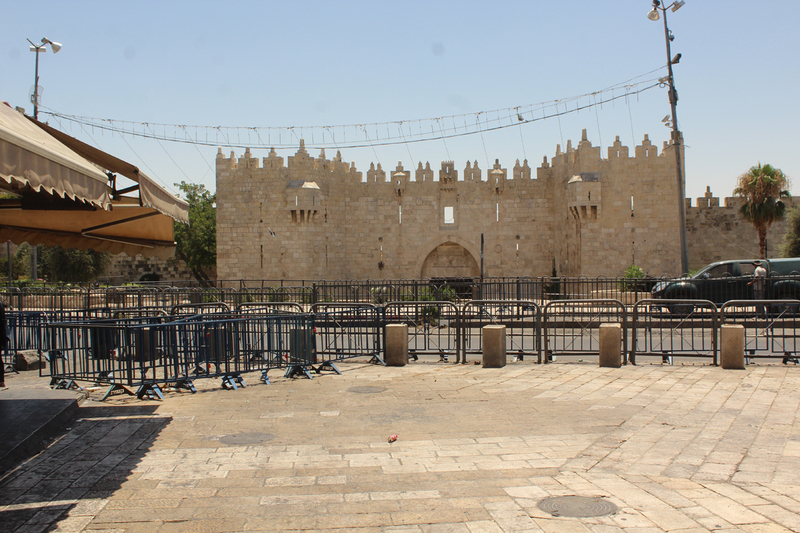 Damascus Gate from Sultan Suleiman street, usually the site of lively activity and gathering. Sultan Suleiman street. In the background, the second layer of checkpoint. Damascus Gate, after the third layer of checkpoints. A young Palestinian man is being searched in a booth by six heavily armed police officers within the Old City.